Here is a great set of hockey drills for atom coaches and players. These drills focus on skating, shooting, checking, evasive maneuvers, team tactics, crossovers, stickhandling, passing and net drives. These drills were produced by the OMHA and are re-published with permission from home town hockey. Feel free to print off these hockey drills and use them in your practice. 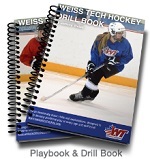 You can mix any of the drills for a great Atom practice plan. The drills are added in order, so some may fit well with the ones above or below them. This first drill is a good warm up drill for atom hockey players. This drill is a great way to evaluate the skating ability of your players. Players weave through pylons, and goes back in line. This is a good passing drill for atom players. Put pylons down the middle so players don’t run into each other. Here is another fun warm up drill which involves stick handling and puck control. The next drill, and a few more drills a bit further down, focus on driving the net, this is important to teach at a young age. Players need to learn where to go after shooting, or when they are in the offensive zone. By teaching the players to go to the net they will end up scoring more rebounds, and getting more goals. This is a great drill that involved passing, shooting and skating. Here is a great 2 on 2 drill, this is a great tactical drill. I hope these drills will help you out. Don’t forget to subcribe to my posts as I am always looking for more great hockey drills and posting them on the site.